Cast: Aaron Kwok (郭富城), William Feng (馮紹峰), Zanilia Zhao (趙麗穎), Xiao Shengyang (小瀋陽), and Him Law (羅仲謙). 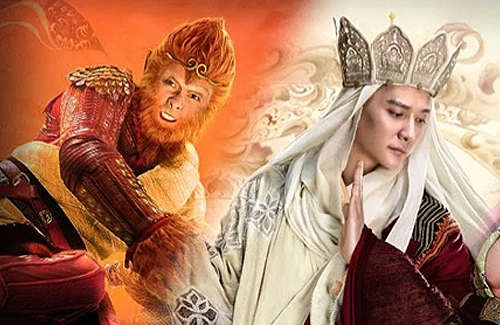 Tang Sanzang (William Feng) and his three disciples Sun Wukong (Aaron Kwok), Zhu Baije (Xiao Shengyang), and Sha Wujing (Him Law) arrive in the all-female Women’s Country. Since the country’s founding, there have not been any men who are regarded as the enemy. Based on the prophecy found in the books, a monk from the east will arrive with a monkey, pig, and a little blue man. When this day arrives, this will mark the destruction of Women’s Country. Watching the trailer makes me feel that I am looking at something in the modern time. It seems that they forget the period is the Tang Dynasty. @lewismcchan Must adapt to modern times. LOL. “choose to love one person or all sentient beings?” Sounds like the monk fell love in modern times. @davy He is a man after all hehehe. Yes, but also very hard to accept. Because Monk Tang Sanzang is very cultivated. Sun Wukong as well. Only the other 2 disciples are easier to manipulate. The stretch for Monk Fahai in Green Snake may be more appropriate but, Monk Tang Sanzang… I rather leave him alone and away from the idea of romance.